One of the most startling yet largely under-reported facets of the European financial crisis is the rate of youth unemployment, especially in Southern Europe. 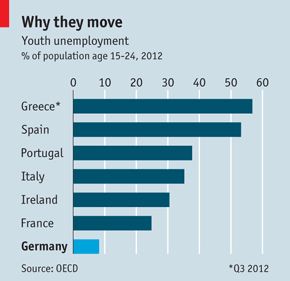 If you are a young person in Greece (58%), Spain (56%), Portugal (39%), Italy (37%), or France (27%) you are likely looking elsewhere already. There are certainly nearby places with a shortage of qualified workers (such as Germany), and when any job is scarce, it may seem a strange time to be seeking your ideal job. Yet, for those of you who studied engineering (especially computer science) that is exactly what I am suggesting. Palantir is hiring aggressively in Palo Alto, New York, Washington, Los Angeles, London, Australia, New Zealand, Singapore, and beyond. If you are not only technical, but also passionate about using technology to address problems that matter most in the word, Palantir (and I personally) would love to hear from you. Why Palantir? Meritocracy: Silicon Valley has the highest concentration of great computer scientists of anywhere in the world. If you are a gifted young computer scientist, you belong with a Silicon Valley company if not in the Valley itself. Of all the great things about Silicon Valley, meritocracy may be the greatest differentiator. There are no long apprenticeship or trainee programs at Palantir (though we are always learning). Everyone is equipped to begin working on real problems within weeks. Good ideas don’t have to pass through a massive hierarchy - the best idea wins, regardless of whose idea it is. Save The World: Palantir is focused on solving the most important problems for the world’s most important institutions, and we are always exploring new uses for our platforms. Some of our major areas of application financial oversight, disease control, narco-trafficking, protection of children, cyber security, protection of civil liberties, and most recently, disaster response. In the face of global austerity, we are helping governments to get the most out of limited resources, and working with financial regulators to prevent the next financial crisis before it happens. These are uncertain and volatile times, especially for Europe, yet there has also never been a better time to be part of something extraordinary.